Ahhhh! I've been buzzing around tonight like a chicken running from the farmer on Saturday Night! I wanted to share a couple of things with you. First, Yes, I am having a "quiet trial" tomorrow (Tuesday) on Ustream at 7 p.m. Central...Don't tell anyone! Come if you have any interest. I will be recording for my European friends and anyone else who needs to take a trip on the crazy side at a later time. :) I've been working on a sample tonight of a fast and easy project so, let's see if I can recreate it tomorrow. LOL! OK, with that said...Onward...Tonight I wanted to share another fast and easy project that I made for this months challenge for the Inspiration Team over at Inspiration Emporium. 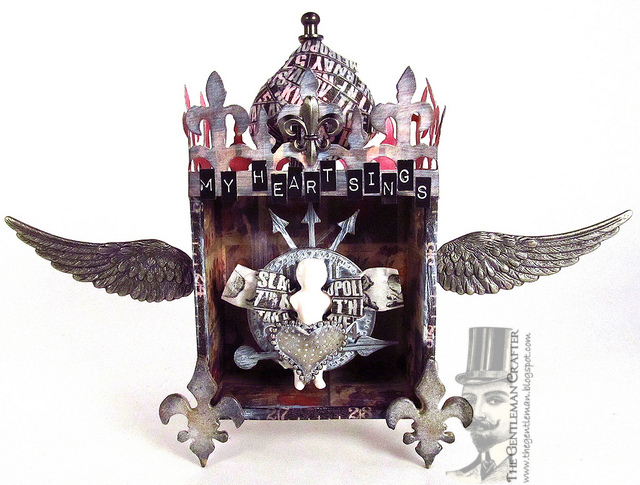 Made from a 3 x 3 Tim Holtz Idea-ology Configuration Box Insert. 1. Ink the 3 x 3 Config. Box with Victorian Velvet Distress Ink on the outside and the interior edges. 2. Apply Tim Holtz Tissue Tape to all sides of the box. 4. Apply Tim Holtz Tissue Tape to all the edges of the box ensuring that you cover the edge of the interior paper as well. Next, apply Tim Holtz Brushed Pewter Stain in various areas on the sides, front, back and edges of the box. 5. Apply Adirondack Picket Fence Distress Paint to the Idea-ology pieces...Time Piece, Heart Charm, and Game Spinners. Allow to dry. 6. Fold tissue tape for wings and adhere to the backside of the Tim Holtz Fractured Doll. Adhere the doll to the timepiece. Next, adhere the heart to the doll. Last, adhere the game spinners to the back of the time piece and one to the front. Adhere the whole assemblage onto a 1-inch wooden block and then glue to the inside middle of the Config. box. 7. 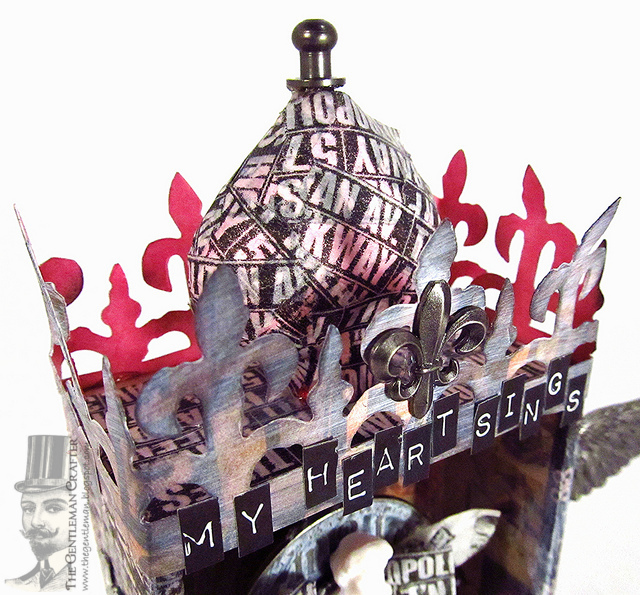 Cut the Tim Holtz Iron Gate On The Edge Die from paper. Apply Picket Fence Distress Paint to the cut piece. Adhere to the top of the shrine. NOTE: I covered a glass heart ornament with Tissue tape and turned it upside down and adhered it to the top for a "domed" effect. The heart ornament came from Joann's. 8. Die cut a shape for the feet. I used (4) of the Tim Holtz Mini Fleur de Lis cut from chipboard and daubed on Brushed Pewter Stain. Glue feet to each corner. 9. 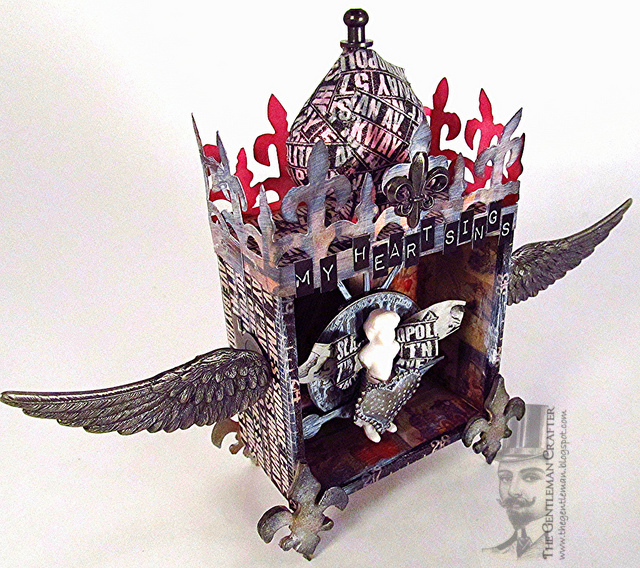 Next, adhere one of each of the Adornment Wings to a Tim Holtz Idea-ology File Tab. Bend the tab to a 90 degree angle and adhere to each side of the box. 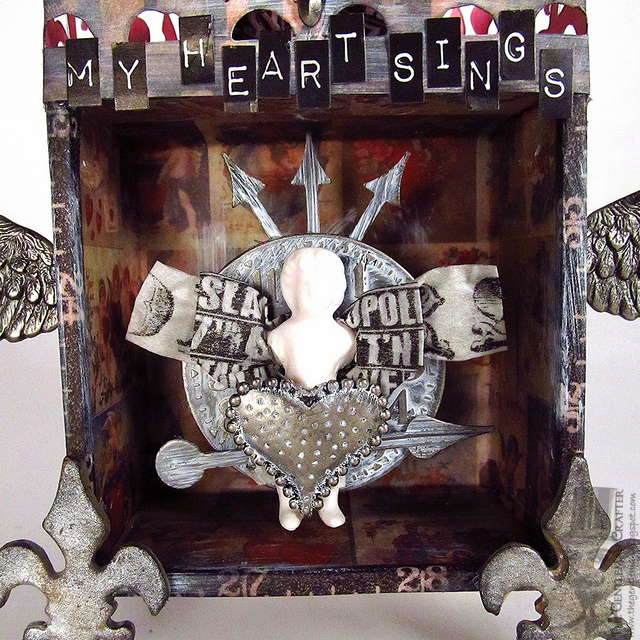 Last, use Tim Holtz Label Letters and apply, "My Heart Sings" to the front! I know you have heard this a million times, but your creations are AMAZING! This configuration box turned out just magnifique! I think I love the fleur de lis feet most of all.I'll definitely be there tomorrow night. Very exciting.Have a good day tomorrow. Just a pity that I'll be sound asleep.... would love to tune in live. Will be waiting for the recording!!! Another great project! Good luck with the Ustream tonight. Lookin' forward to tonight's show...even though I'll get there late. Love the little shrine! Good luck tonight!!!!! Awesome project! I love everything about it. AWESOME!!! Good luck with the Ustream. It's gorgeous! Thank you too for posting the instructions! Always so much better to have them than just a picture or two. :o) It's great to know that you used the new picket fence paint on the metal pieces and the die cut around the top. So hard to tell important details like that from pics. I was wondering where you had gotten all the heart ornaments you've been using...haha see I read the instructions!.. now I have a trip to Joann's planned. Good luck with the ustream... we're off on vacay in the morning so you know how that is...busy busy busy... so I probably wont catch your new ustream for a couple weeks. Have fun! OMG... I love your configuration box! Thanks for the step by step tut on it also! I will be on Ustream tonight, I can't wait to see what you have for us! You Rock and Have a fabulous day! You rocked the shrine! Loving the fleur de lis. Will be there tonight; a little late as you start right as I'm getting off work. Looking forward to it. You will be great! this is such an awesome project BUT where did you find the hearts? I can't seem to find them anywhere. we have zip for cool craft store up here in the freezing north... maybe somewhere on line? Jim, you blow me away with your awesome creations. You may consider this to be quick and easy, but I am really impressed. Beautiful. BTW...I tried my first mixed media piece on the blog today...would love your input if you have a half a sec... http://www.kathybydesign.com It was a real challenge for me. Not sure if I like it or not....Anyway, cheerio and keep on craftin'. So looking forward to it Jim. I will be there. Might be a little late, depending on when my daughter picks up the girls. Who knows, they may be joining us tonight also (depending on their mood). Ha Ha. Loved your inspiration piece. You are just to talented for your own good me thinks!!!!!!! LOL. Love your little config box, it is sooo cute! Okay, now we have to have a "come to Jesus" meeting... please tell me you are not planning on doing your UStream show on Tuesdays at 7pm CST!!! That's when I have my weekly date with Mark Harmon and NCIS! Woe, woe, woe is me if I have to make a choice between 2 of my favorite men! Anyway, just had to share! See you tonight, at least in spirit! I love this piece, the upside down heart is so cool. Of course I never would have thought of that. I am so excited about tonights u-stream. I will definately be there! Love your little heart sings box!!! Can't wait to see you on Ustream tonight --- I am going to try multi-watching tonight (like multi/tasking) ---your show starts the same time as puck drop on the San Jose Sharks hockey game ---HAHAHA!!! Love this! Now I need to go buy the fleur di li die, or do I own it? Better check first. Thanks for the Ustream tonight it was a blast!! Tell Cesar he did a good job trying to stay up with us chatterboxes! Jim you never cease to not only inspire but blow me away. I think I might give this a go just to see what I can do . Love it. Awesome project Jim, it makes my heart sing! wow, I love your configuration box, so many gorgeous elements. What a stunner.. those fleur de lys feet are insanely fabulous! !